Home | Practice Areas | Social Security | What Is the Social Security Disability Interview? So, you have decided to apply for Social Security Disability Insurance (SSDI) or Supplemental Security Income (SSI) benefits because you are no longer able to work. Or you have not been able to work for a few months, but now you need to apply for benefits. The first step toward receiving benefits is the disability interview. What is an SSDI or SSI disability interview? It is your first chance to prove to the Social Security Administration (SSA) that your disability, whether physical or mental, is severe enough that you cannot work in any meaningful way and that you require financial assistance. One of your first steps is to determine which form of benefits is most appropriate for you. What Do I Need to Know Before I Do the Interview? What Is the Information I Need to Bring With Me to the Interview? How Should I Conduct Myself During the Interview? How Likely Am I to Receive Disability Benefits? The SSA runs both programs, and the medical requirements for both are the same, although the two programs are very different. 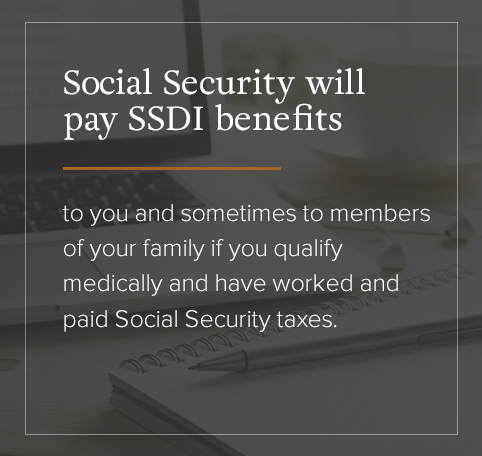 Social Security will pay SSDI benefits to you and sometimes to members of your family if you qualify medically and have worked — either for a business or yourself — and paid Social Security taxes. Under the SSA requirement, you earn one credit for each $1,320 of wages. You need to have earned 40 credits, 20 of which must have come in the last 10 years. Younger disabled workers require fewer credits. You cannot have more than $2,000 in assets individually or $3,000 in a couple. You need to be earning less than $1,180 per month. We will explain more about the information that is needed for the SSDI interview and the SSI interview below. We will also tell you about the additional information that you need to produce during an SSI interview. Call toll-free telephone number 1-800-772-1213. If you are deaf or hard of hearing, you can call TTY 1-800-325-0778. Call or visit your local Social Security office. If you are going to file your application at your local Social Security office, call and book an appointment in advance. Of the three methods available to file a claim, the best one is to contact your local Social Security office and do an in-person or a phone interview. Completing an application online is easy, but there is no SSA representative to answer your questions, and any mistakes you make during the application process can come back to haunt you when the SSA is determining your eligibility. You cannot apply for SSI benefits online. Arrange a time to conduct an in-person interview at their offices. Arrange a time to do a phone interview. It does sound a bit repetitive. But we cannot stress enough the importance of preparing the proper documents — such as your medical and work histories — in advance. Even if you can recite them off the top of your head without error, putting them on paper helps both you, any person working with you and the SSA representative who is hearing your claim. Why hire a lawyer? A study done by the Government Accounting Office (GAO) shows that when a person hires a lawyer to help them, they are three times more likely to have their benefit claim approved. Those are the kind of odds you cannot afford to ignore. And you do not have to worry about any lawyer taking you to the cleaners. The government must approve any agreement about fees between a lawyer and any client they are assisting with a benefits claim. And if, in the end, you do not receive benefits, you will not have to pay your lawyer a single cent. A government issued picture ID. Your birth certificate (if you have it). A complete list of your medical conditions, including information on when your conditions became disabling and the date you last worked. Please be as specific as possible. This list is also important in helping the SSA determine whether you have a disability that meets the requirements to receive benefits. Normally, that disability needs to fall within a list of impairments created by the SSA for adults or for childrenand needs to be either terminal or projected to last at least a year. Partial disabilities will not be approved. The places where you received medical treatment. Include the names, addresses and phone numbers of the doctors, clinics or hospitals as well as the dates those treatments were given. It is particularly important to include the first places that treated you for your disability, as this will be essential in establishing the onset of your disability, which is crucial for determining back pay. All the medications you are taking and the exact dosage. Any medical test you have had, the dates you had them and where you had them done. Your work history for the past 15 years prior to your disability. Be as exact as possible. Do not say “I think I worked here in 2010.” Instead, say “I worked here between January and November 2010.” Again, it is important to write these facts down. Even if you know your work history by heart, it can be easy to get flustered during an interview, and you may miss or misstate a critical piece of information. The SSA allows for the exclusion of one vehicle and the land you live on when you are applying for SSI benefits. However, any other vehicle or land will be applied to the resource limits mentioned above, which are $2,000 for an individual and $3,000 for a couple. If all of this seems daunting, it perhaps gives you one clue why the SSA denies so many initial claims. Currently, the number of claims approved on their first try is only 30 to 35 percent, depending on which part of the country you live in. This rate also gives a good reason for hiring a lawyer to help you prepare for your interview. People applying for SSDI or SSI are often in pain or unable to function normally. Having someone to help makes a big difference. One more thing. Do not miss the appointment. Even if you have only part of the needed information or none at all, it is still important to keep the SSA disability benefits appointment. It is difficult to know if your claim will be approved or denied based on the information that you provide during your disability interview. But you cannot give any information if you are not there, so make sure you show up. Dress neatly: You do not have to go overboard, but you should maintain a respectful, professional appearance with clean, formal clothing. Tell the truth: Sometimes, people exaggerate their symptoms, thinking that doing so will gain them more sympathy. If your exaggeration, however, is inconsistent with other information you have provided, the SSA will deny your claim, so it is always the best idea to tell the truth. Show your desire to work: Make it clear to the person interviewing you that you would rather be working than dependent on benefits. Clearly identify your disability: Sometimes, people suffer from a range of problems when they apply for benefits. Do not go on and on about every issue you might be having. Identify the main reason you are there, and clearly describe it during the interview so that you can explain exactly how it prevents you from working. Avoid being vague: For instance, if the interviewer asks you to describe your pain level from a scale of one to 10, do not say “10 all the time.” If it were 10 all the time, you would more than likely be in the local emergency room. Think about how it really feels. Maybe the level is at a four when you get up in the morning, a six around noon and a very painful nine or 10 by the end of the day. Always be precise with these details. Back pay provides one of the best reasons for taking the time to prepare your documents and hire a lawyer to help you get ready for the interview. You can receive SSDI or SSI back pay that covers the 12-month period prior to when you filed your initial claim if you can prove that you have not been able to work during that period. The importance of keeping accurate records about when you first started to receive treatment and the correct date on which you were unable to work is clear. For instance, if the SSA takes five months to approve your initial claim, you could be eligible to receive up to 17 months of back pay. The more documentation you can provide about the onset of your disability, the better your chances of receiving back pay. Stay with your claim. Your chances of success improve with each step of the appeals process. Continue to keep and document your medical appointments. Just because you started a disability benefits claim, it does not mean it is time to stop your medical visits. Hire a lawyer. Remember that your chances of being successful triple when you hire a lawyer to help you with your claim and prepare you for the disability interview. Currently, there are about 1.1 million Americans waiting to hear if their benefits claims have been approved. That is a lot of people, many of whom probably tried to negotiate the SSDI or SSI benefits thicket on their own. Relax. Preparing for the Social Security interview questions does not need to leave you feeling stressed. Remember the importance of preparation. Document everything. Often, family and friends can help you fill in dates that may be a bit hazy. Former employers can help with missing periods of employment. During the interview itself, stick to the facts. Be clear and precise. Do not embellish. Write everything down beforehand, even if it is clear in your memory. The more prepared you are for the interview, the less likely it is that you will feel panicked or flustered. Finally, find a good lawyer to work with you, like the lawyers at KGB Injury Law. Remember, when you work with someone on your claim, you triple your chances of receiving a positive outcome. KGB Injury Law knows how to help you prepare for the SSDI or SSI interviews. Our experience and knowledge in these fields are second to none. We understand that preparing for a disability interview with the SSA can leave you feeling overwhelmed and confused. We can help you with the preparation of documents that are needed for the claim and get you ready for the interview. At our company, we believe that all our clients should be treated as people and not just as cases. We care deeply about how we treat the people who choose to work with us throughout the entire disability claims process. Your success is our success. You can get a free consultation, 24-hours a day, on our toll-free line: 800-509-1011. Or visit our web page and tell us why you want to file a claim. We will contact you and discuss establishing a relationship to help you with that claim.